A stylish pair of ear-studs has always been an in-thing in a woman’s wardrobe. These earrings can be camouflaged with a trendy pair of jeans and tee. Else you can pair them up over a long Victorian gown. For a formal office-wear, a chic pair of earrings can look incredible on you. The staple is therefore the most versatile form of jewelry. You have a pretty looking diamond earrings. The pair takes shape via sterling silver. 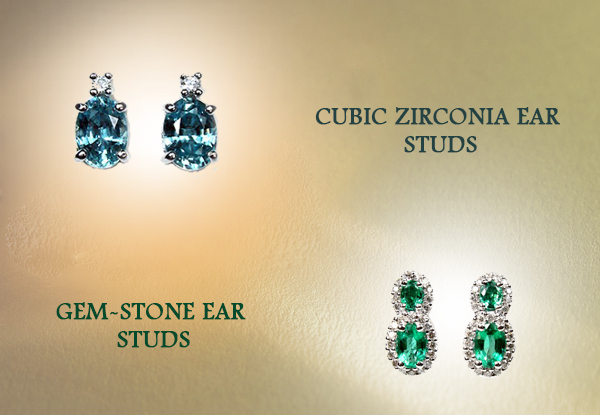 At Hello Diamonds, you have lab-cultured diamond stones added to the earrings. However, if you own heirloom or loose diamond stones, you can ask a custom designer to have them etched on to the attractive looking form of jewelry. Your dangling based diamond solitaire earrings is all out for display. 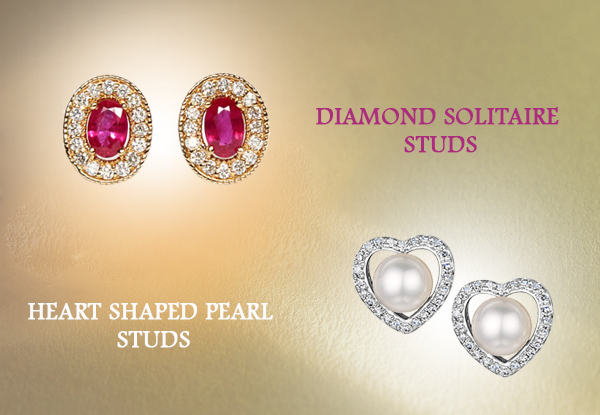 These are pearl studs embedded to a perfect heart shaped setting. The setting takes its flavor via the purest form of sterling silver. The studs are given a new coat of polish to make them sparkle brightly in the sun. Pair them up over a floral blouse and a boutique printed skirt to lend yourself, a diva kind of a look. To give your earrings collection, an all-new upheaval, you can go in for a great looking pair of earrings from Hello diamonds. This is a sterling silver square shaped setting. You have those sparkly cubic zirconia stones attached to each ear stud. The stylish pair of earrings go well with dungarees. This a fabulous looking gem stone earring, you add to your jewelry collection. The stone used is aquamarine. The sterling silver setting has the aquamarine stone studded with posh stones. The diamond stones are worth 0.015. You have a ball pin stud at the back. Earrings can accentuate a noticeable part of your body. These trendy sets on jewelry add a better degree of tint, to enhance your facial features too. For your super-sonic mom who is always on the move, all through the year, these are fabulous jewel sets that can leave her pampered, end of the day. You can curate your own gift hamper, with these pretty-looking diamond earrings from Mother’s Day special. You can go for the stylish pick on giant sized hoop earrings. 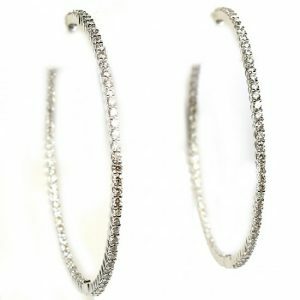 The hoops are made from a stunning variety of 14K white gold. 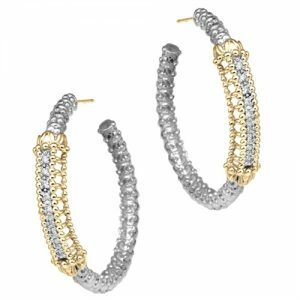 Posh diamond stones are adorned across the hoops. The attractive piece of jewelry makes an ideal gift for your mom. She can wear it to work, bash events and lot many. As you all must be aware of, Alwand Vahan has his unique style of designing contemporary styles on designer jewelry. These splendid array of jewel sets follow the traditional design fused with trendy vibes, out there. Vahan styled jewelry is therefore, the best selection indeed. The wide-hoop earrings come to you with a crisscross design. The outlay is studded with sparkling diamond stones. The Vahan’s signature styled jewelry can leave eternally etched memories, in your mom’s heart. The fabulous collection on diamond earrings-Mother’s day is brought to you by a designer label named Gabriel and Co. The fabulous piece of jewelry can be matched to suit any kind of costume and occasion. 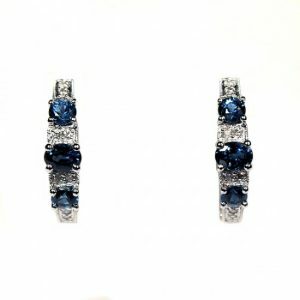 The celebrated pair of earrings come to you with sparkling deep-blue oval sapphire stones. You have the dainty piece of earrings hand-crafted with a ribbon styled detailing, coupled with sparkling diamond accents.